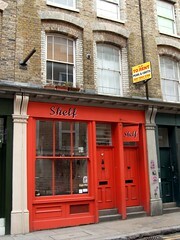 A design shop just off Brick Lane, in Shoreditch. This small boutique store, one of a long line of such stores on this street, sells attractive artisanal and artist designed items. It has original artworks and posters, plates, bowls, vases and other ceramic goods, handmade notebooks and stationery, some textiles, and a range of ceramic letters which they also sell on the website. The emphasis is on colourful patterns with plenty of birds and bird-related designs in particular. Given that a lot of the goods on sale here are limited editions or even one-offs, the prices tend to reflect this. Last visited by Ewan, 18 December 2008. Opening hours taken from website, December 2008. Last edited 2008-12-23 22:48:04 (version 3; diff). List all versions. Page last edited 2008-12-23 22:48:04 (version 3).